Published on August 8, 2013,	by paba7 in public outing. VID 20130801 203427 from paba on Vimeo. Firefly was honored to be selected to be exhibitor in the Living Machines Exhibition on August 1st at the Science Museum in London, UK. 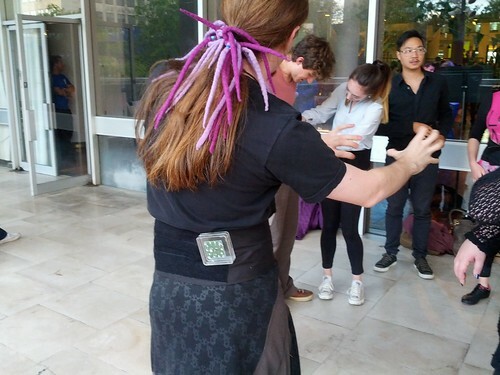 The exhibition was part of the 2013 Living Machines Conference that focused on the intersection of research on novel life-like technologies inspired by the scientific investigation of biological systems. Thank you to Charles Fox and Tony Prescott for all their hard work in setting up such a lovely event. Flashing patterns in the game. For the Living machines Exhibition, we reprogrammed the fireflies boards based the flashing patterns of one of the 5 main subfamilies of fireflies: Photurinae. In North America, these are the fireflies you’re probably most familiar with. Not all fireflies in this subfamily light up, but those that do are generally divided into three closely related species: Photinus, Photuris, and Pyractomena. The Photinus are the most common of this group and the species used for the flashing patterns in the game. 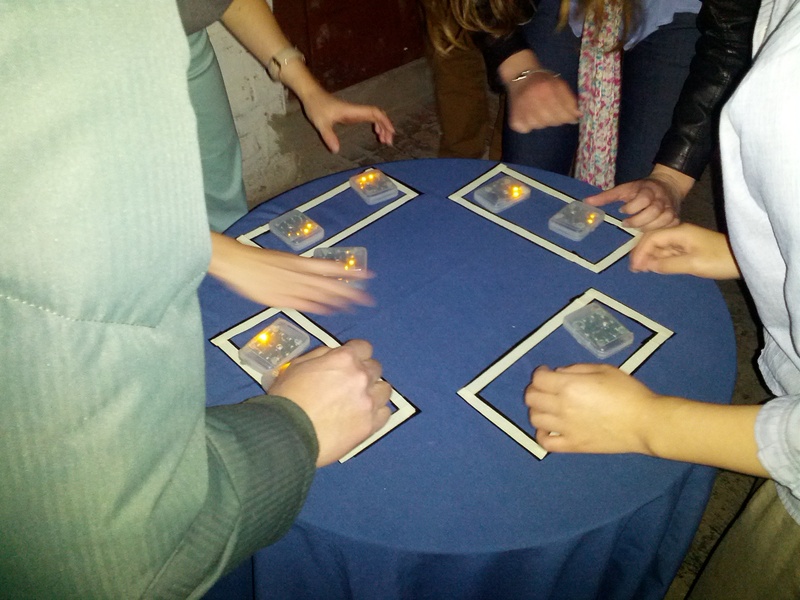 The flashing patterns used in the game are based on the flashing patterns between male and female fireflies of Photinus curtatus and Photinus pyralis. The game’s flash patterns are not a direct mapping but reflective of the timings and visual pulses and trails of the fireflies in nature. We were excited to unveil version 2.0 of Firefly. We made new boards that are easier to program. This will allow us to expand the options of gameplay for Firefly. We were able to test out the new design and new programs at the Living Machines exhibition. VID 20130808 171214 from paba on Vimeo. Published on June 1, 2013,	by paba7 in Uncategorized. Firefly was run for two weeks in Digital Shoreditch’s Great Exhibition. It was held in the basement of the Shoreditch Townhall. The basement was an amazing space created by a labyrinth of tunnels. We were excited to get to play the game in the dark!!! Published on May 19, 2013,	by paba7 in playtime. Firefly was run in the play test session of GameCamp6. It was a great day. Players had fun and provided thoughtful feedback. 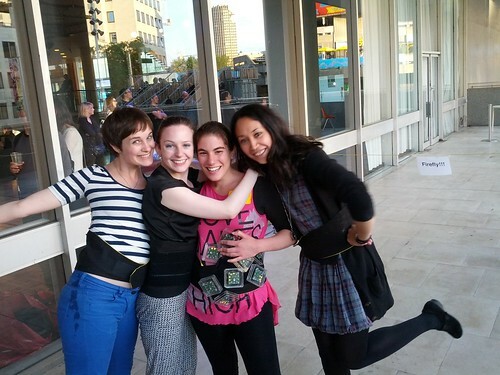 We were happy that we were able to play at GameCamp6. Published on February 13, 2013,	by paba7 in public outing. Firefly is a tagging game that explores temporal memory, and exploits the balance of collaboration and competition. The game is designed to be played in the dark. 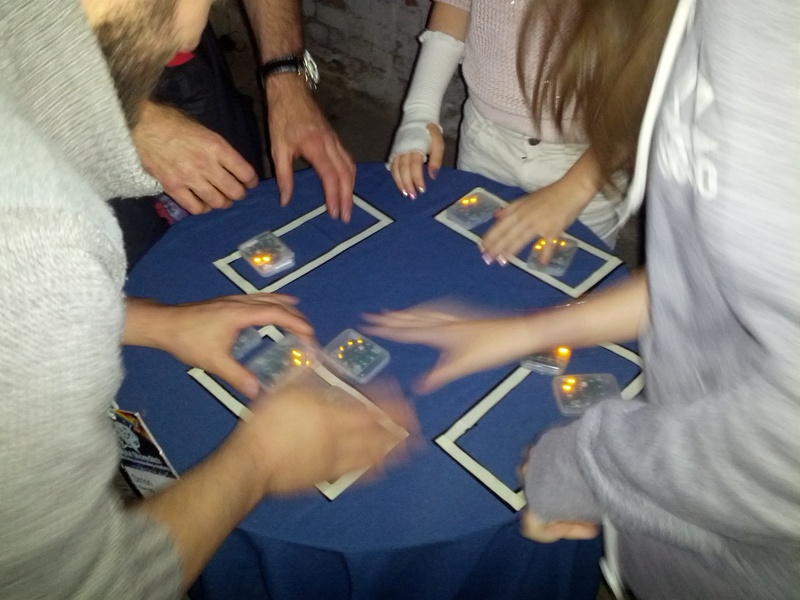 Players, wearing flashing LED badges, compete to see who can steal the most badges from other players. 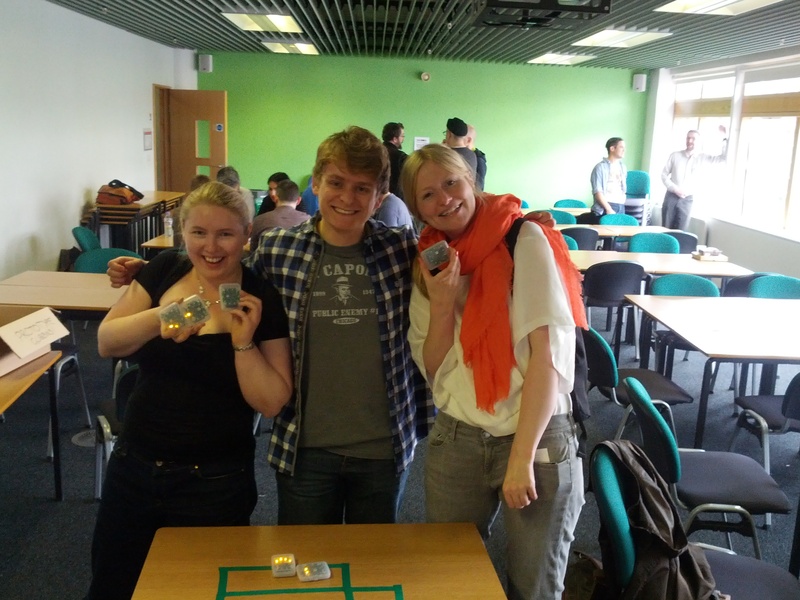 The winner is the person with the most badges at the end of the round. 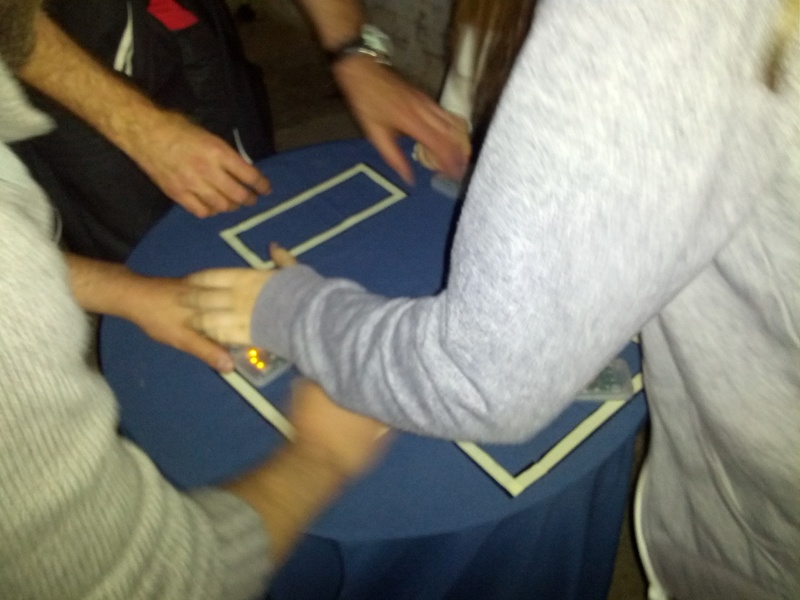 The key component of Firefly is that player can only steal a badge when the light is OFF. This is where the exploration of temporal memory comes into play. 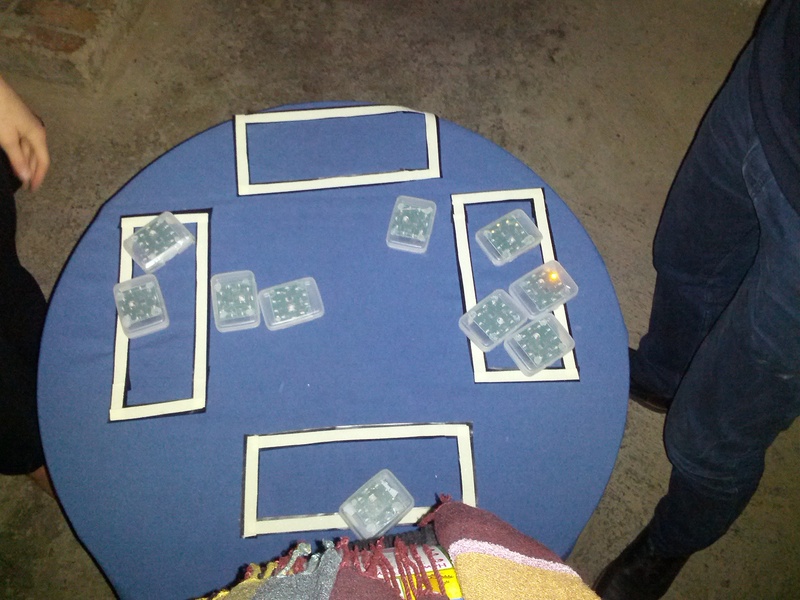 The players can track each other while their badges are lit up but must find and steal a badge when it goes dark. The challenge is to continue to track players after the light is gone. It is this tracking that is using the same memory skills we have for remembering where we parked our car. 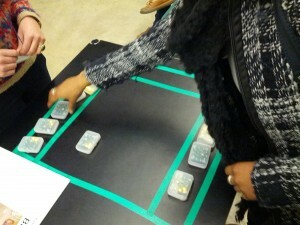 In the Digital Futures session, we demonstrated a tabletop version of the game. 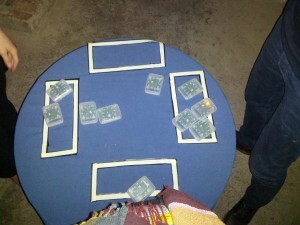 It applies the same principles of tracking and memory in a less rambunctious version of the BIG game.The table top version is played with 2 to 3 players. Players have “nets”. All the fireflies start in the center field. Players can take a firefly and put it in their net when the light flashes off. However, players have to be vigilant. Just like in life, a firefly is not permanently captured in a net. When the light goes off again it is up for grabs by any player. 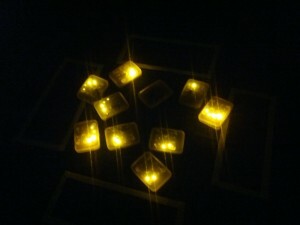 Players have to keep track of their and other players fireflies with the goal of being the one with most when time runs out. 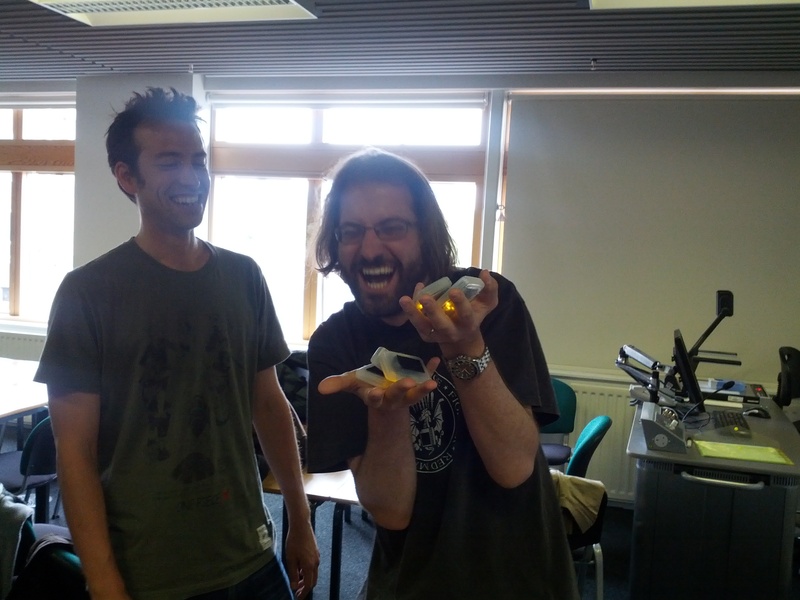 We active worked on the current game component as well exploring the next iteration of the game. We began designing a new circuit for the next generation of Badges in Eagle. 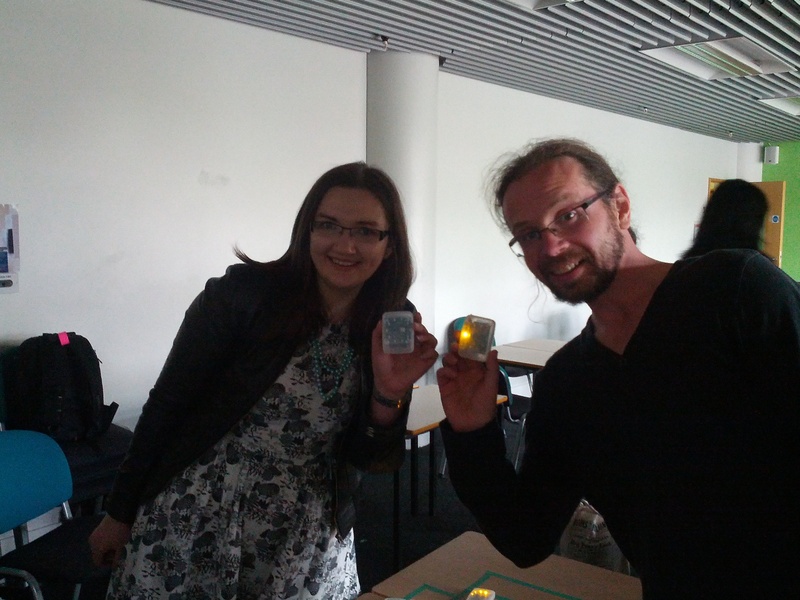 We reprogrammed badges to explore different timings in game play. It was great fun and informative at Digital Futures. 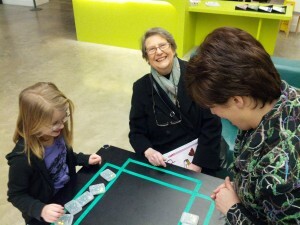 We had many players of all ages play with us. 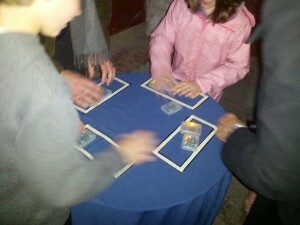 Many played several rounds of the game. It was quite informative and entertaining to see different strategies. It was an amazing experience. We are honored to be part of Digital Futures. 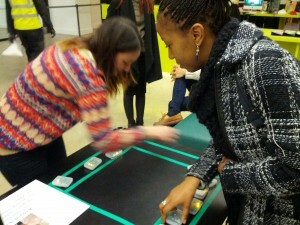 More information about Digital Futures at the V&A. See Irini talk about Digital Futures. Published on June 24, 2012,	by paba7 in public outing. Firefly was run in the daylight at the Hide & Seek’s first sandpit of the summer on June 18th. It was a great venue at Southbank Centre in London, UK. The theme was performance. Firefly was played on the balcony. It was more full contact in the light of day that the in dark. The game was played in two versions: everyone man for themselves and tag team. We experimented with badges being on the front or on the back. In this situation, playing in teams with badges on the back was the most satisfying. We had some excellent suggestions and feedback. The main feedback was some type of audio indicator as to whether a badge was take legally or not. A positive sounds for a proper steal and buzzer sounds for improper steal. 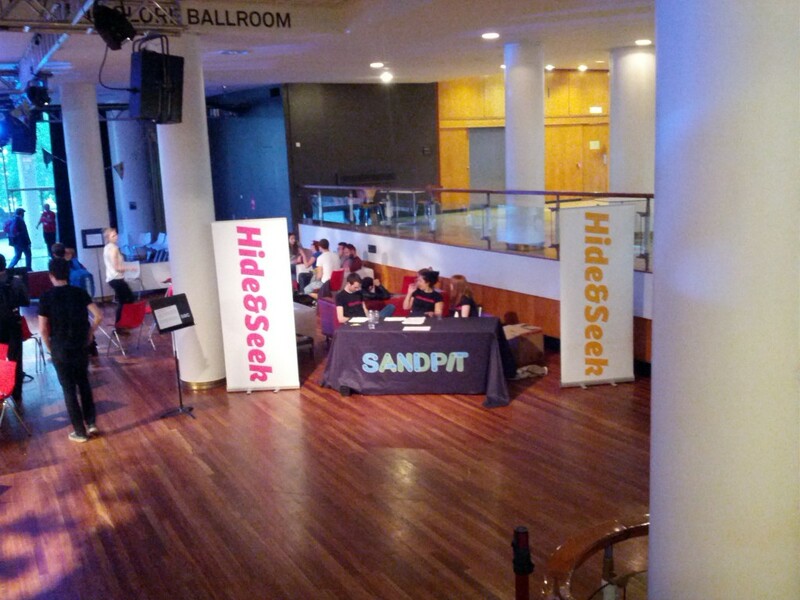 See the videos and pictures from the Hide & Seek Sandpit: See us play. We will be running Firefly throughout the summer and look forward to playing with you. Check back on this site: come play or follow us on twitter @fireflygame as we continue to add more venues.